I can't believe October is here! Ever since I found out I was pregnant in the beginning of the year, I have been counting down the days to October (my due date is October 9). This month has always been one of my favorites, and I know this year it will definitely be my favorite because our little guy will be here! As for my goals this month, I am keeping them pretty simple. I know I will be adjusting to life with a newborn, and my main priority will be bonding with him and figuring out this whole "mom" thing! This is always a tough one for me. I am really consistent for a period of time, then I get out of routine. This month, especially as I start this new chapter in my life as a parent, I want to make quiet time with God my number one priority. I know, I know! It's a little early to be talking about Christmas! I feel like the holidays are going to sneak up on me, so i want to get a head start. Most of my shopping will probably be done online this year. I am looking forward to shopping for everyone... I LOVE finding gifts for my family and friends. I don't know what our plans are going to be for Halloween this year, but I am assuming we will stay home and pass out candy since our baby will only be a few weeks old. I don't think Landon or I will dress up this year, but of course I need to find Lincoln's first costume! Hehe! 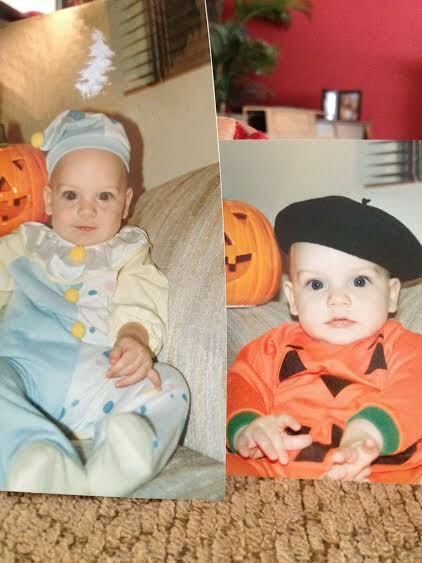 Here's my husband, Landon, on his first Halloween. He was about five months old. Since I am on maternity leave, I am spending more time at home. I love watching tv, and I am currently catching up on Scandal. (Don't tell me what happens, I'm on Season 4!!) I will probably start a new series on Netflix, but I don't want to spend all my time watching television! So I plan on reading a few books. My coworker got me the book, Maternity Leave, by Julie Halpern, and I'm LOVING it. I do want to find another one to read. Any suggestions? I know it's going to be hard to find time for date nights once baby gets here, so I would like to at least have one more night out before he makes his arrival. Well, that's it! Happy October to all of you! That book looks too cute!! I may have to check that out!! You are so close!! Best wishes!! What's Up Wednesday... Two Weeks Late!